Candymaking never really interests me. Of course baking is already an exact science. However, the temperature precision and the perceived danger of working with sugar have always make me wary. It just seems to me so many things can go wrong so easily. Well, until recently. My little Holiday Fudge project was unexpectedly fun. And now I'm itching to try something a little more challenging. This recipe is adapted from David Lebovitz's Salted Butter Caramel (his recipe is much better written recipe with helpful step-by-step pictures, go visit!). This salted butter caramel is so unbelievably addictive. It starts off a bit hard but a few seconds in the mouth and it yields into such soft chewiness. Oh, and the richness! The moment I remove the lid from the apothecary jar, I could smell the irresistable sweetness of cream, butter, and sugar. 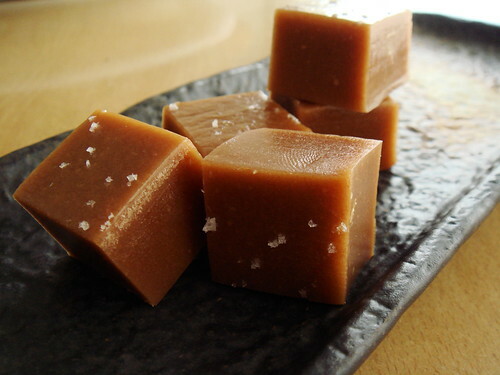 The lovely saltiness of fleur de sel prevents this caramel from being cloying and adds loads of complexity. I never knew candymaking can be so rewarding. Line a 9x5 loaf pan with foil. Grease the inside. In a small pot, mix together cream, 2tbsp of butter, and 1/2 tsp of fleur de sel. Bring to boil and remove from heat. Stir in vanilla. Cover with lid and set aside. In a medium pot, heat sugar and corn syrup to 310F. 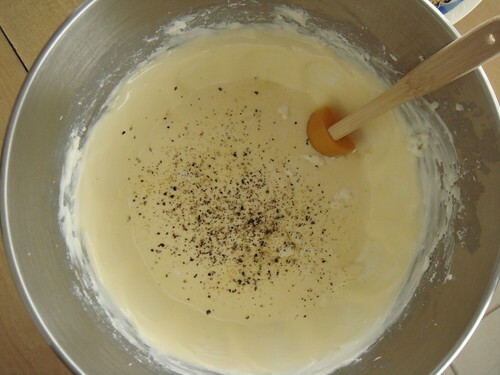 Remove caramel from heat and stir in cream. It may bubble up but just stay calm. Heat the mixture back to 260F. Remove from heat and stir in remaining 2 tbsp butter until everything is mixed in. Pour caramel into prepared pan. Sprinkle with 1/4 fleur de sel. Let it cool overnight. Unmold caramel and cut into small squares. I find a heated chef knife works best. Because all candies deserve to be pretty, I decided to wrap each caramel in wax paper. You may woner why I would bother to meticulously wrap each piece of candy in wax paper. There is actually a very practical explanation aside from the fact that I love to wrap presents. You see, after painstakingly cutting the slab of caramel into perfect little squares, I blithely put them away in a box. A few hours later, I was dismayed to find that the squares stuck to each other. So I cut up tiny rectangles of wax paper and wrapped them all up. At this point, it just seemed wrong to stowaway in a dowdy sandwich box. A few years ago I bought a bunch of pretty apothecary jars from Loblaws. I had no idea what to use them for so they've been gathering dust somewhere on the shelf. 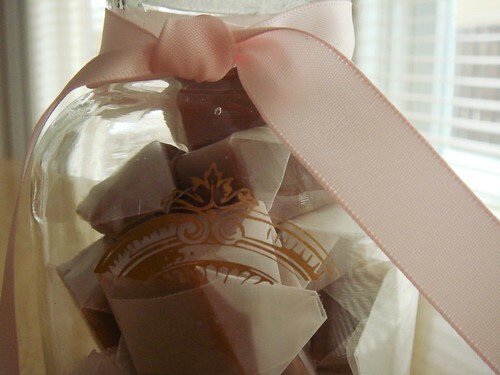 They are quite simply the perfect vessel to hold these homemade caramel candies. To make the whole presentation more glamourous, I play up the vintage feel and put a golden decal on to the side of the glass jar using transfer sheet. A simple knot of ribbon completes the presentation. With much anticipation, I returned to Green Barn Market again last Saturday. Except that this time, I was not in a hurry and I could linger to my heart's content. I enjoyed the cheese curds and kale so much last week that I hoped to get more. Of course, the caveat about shopping at farmer's market is that you can't expect the same thing to be available every time. Depending on seasonality, availability (most of what we get now comes from storage. If we run out, we run out. ), and the farm's schedule (not everyone set up stands every week), there's no telling what surprise awaits me at the market. Well, that was just a long-winded way to say I did not come home with cheese curds and kale in my basket. Fortunately, I did not return empty handed either. In fact, I was far from disappointed. Let's take a look at all the goodies I got. 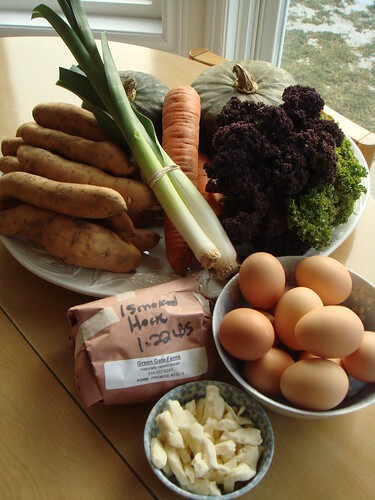 Highmark Farm: The carrots that I picked up last week half-heartedly were real eye-opening. I've been eating supermarket carrots all my life and never did I realize the texture of carrots can be so complex. It was not a simple crunch. When I bit into the gently steamed carrots, they tasted like layers that unfold the sweetness within. Of course I had to buy a couple more this week. I also bought two large red onions for dishes that I plan to cook soon. I enjoyed the eggs from Weber very much last time but I'm also curious about other vendors so I got a dozen free-range eggs from Highmark. Sosnicki Organic Produce: This was one of the bigger stands at the market (the perogi place) with the table overflowing with carrots, beets, radichio, and potatoes. I bought some finger-size Nelson carrots and a few Kresler beets from them. When I asked for suggestion on preparing the beets, they were very helpful with detail instruction. The beets were pretty good after roasting in the oven. The carrots were okay but pale in comparison to the other carrots I bought. Woolerdale Farm: This is where I got my most prized purchases this week. First, there were the purple carrots. They are the most psychedelic carrots ever. Once I peeled away the dark skin and chopped them up, I was treated to a rainbow of colour ranging from purple to crimson to orange to a golden core. Prettiest carrots I've ever encountered! Yes, they were sweet and had wonderful texture too. Beauty and substance combined in one simple carrot. When I first approached the Woolerdale table, all I saw was an array of winter squashes in all shapes and sizes, mostly on the petit side. They looked rather like the decorative squash bins that I see often at supermarkets around harvest time. However, upon closer inspection and I was holding my breathe in excitement. Could that bright orange globe possibly be a tiny potimarron (a portmanteau of potiron/pumpkin and marron/chestnut)?? I've read about these many times before and their popularity in France. Already being a huge fan of kabocha squash, I am especially interested in their similar taste profile to chestnut. This variety of squash is not widely available in Ontario though and honestly this was the first time I ever saw them in person. The lady at the stand confirmed my suspicion and I immediately blurted out "How many do you have? I'll take them all." I plan to use them for this Warm Hokkaido Squash and White Bean Salad. I can hardly wait. Fifth Town Artisan Cheese Co: I was hoping to see either Fifth Town or Monforte at the market. Luckily, I was not disappointed. They brought in three selections including Wishing Tree, Bonnie & Floyd, and Goat Cheddar. A side-by-side tasting later and I immediately fell in love with Wishing Tree, a sheep's milk hard cheese that is dense, nutty, and slightly mineral. Happiness is at home with a couple of potimarrons. I don't venture out to midtown often so when I do, I want to make the most of my trip. Last week I was tipped off by chowhound that Summerhill Market is now carrying Fage greek-style yogurt. My heart skipped a beat. You see, yogurt is one of my comfort foods and the thick creamy taste of strained yogurt really cannot be beat. Not being available in Ontario, I gorge myself silly with Fage yogurt everytime I make a trip to the US. You cannot imagine my excitement when I arrived at this gourmet grocer. 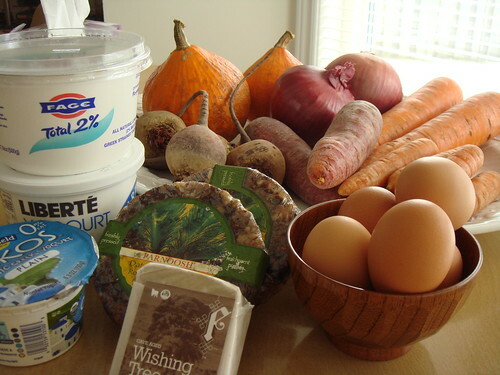 In the dairy refridgerator, I saw Fage, Stoneyfield Oikos Organic, Liberte Grec, Chobani, Siggi's, and Skotidakis. I was in strained-yogurt heaven! Grocery shopping makes me happy. That's a fact. I've been fascinated by beans recently. I want to learn how to cook them well and how to turn them into nutritious meals. Of course, as a fan of beans on toast (Heinz, of course), it is inevitable that I learn to make baked beans. There are plenty of regional variations but the basic remains the same: beans, pork, sweetener, and water cook over low heat for long hours until beans are mushy tender and all the flavours meld. A few days ago, The Pioneer Woman blogged about her lost recipe for Boston Baked Beans and I marvelled at the simplicity of it all. I especially love the layering approach and how little attention the recipe requires. It is almost magical that I can leave a pot of raw ingredients in the oven overnight and wake up to delicious smelling baked beans in the morning. Obviously, a girl can only eat so much beans on toast (besides, I'm not even suppose to eat toast in the first place but that's story for another day). Baked beans are in fact traditional staple in English and Quebecoise breakfast. Of course, eggs belong on a breakfast plate like peanut butter belongs with jelly. Bring these two breakfast ingredients together seems like a match made in heaven. 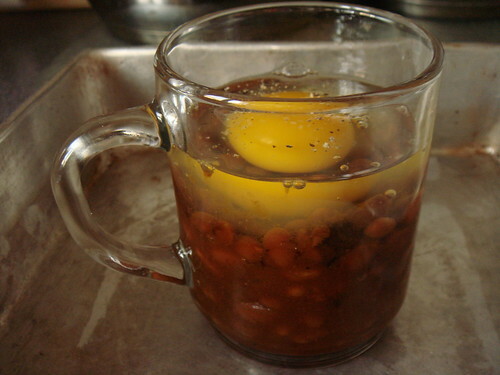 My Boston Baked Beans Oeuf Cocotte is a protein-rich one-mug meal. The best part? It's perfectly portioned so you wouldn't feel like you just eat too much of a good thing. Breakfast of champions in all its glory. Preheat oven to 425F. Fill a small pot with water, bring to boil. 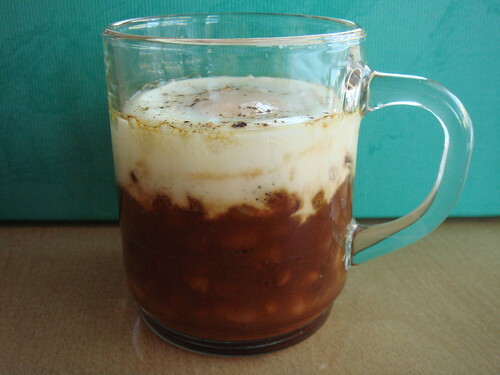 Fill a coffee mug with baked beans. Gently crack an egg to sit on top of the beans. Season with salt and pepper. Set the coffee mug in a small pan (I used an 8x8 square cake pan). Fill the cake pan with hot water to that the water comes up to about 2" of the side of the mug. Apparently my breakfast cannot stand to be outdone by my morning routine and wants its own water bath. Slide the whole thing into the oven and bake for 10-15 minutes, depending on how you like your eggs. When your oeuf cocotte is done, remove it from the oven very carefully. The water bath is hot!! If you're the kind of person who cannot function before your morning coffee, make sure that you have a few sips of coffee first. I prefer my egg a little runny. That's what mine looked like fresh out of the oven. You can sorta see the hot water surrounding the mug. The best part of oeuf cocotte is mixing the runny yolk with the tender sweet beans. What a lovely way to start my day! After my shopping trip to Green Barn Market, my house is loaded with Ontario produce and dairy. I wasn't particularly thinking of what to make when I made my purchases. 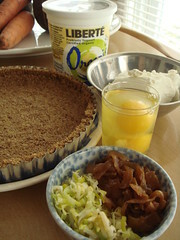 Serendipitously, I had everything I needed to make an onions & leeks goat cheese tart. 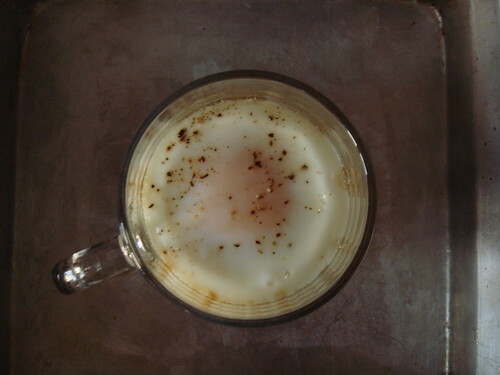 It's not quite the same showcase dish as quiche for those gorgeous farm-fresh eggs I bought. But who doesn't love goat cheese? The crust is a bit of an experiment. Of course I can use a reliable pate brisee recipe but I was curious. 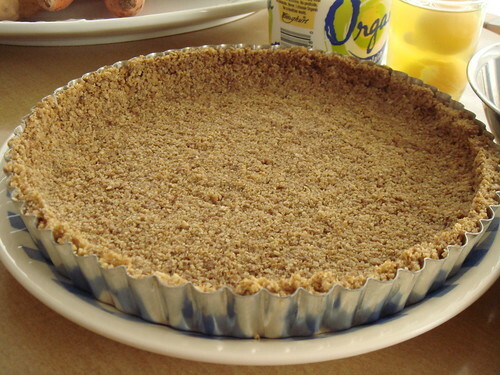 Graham cracker crumb crust is so easy to make but how do I adapt it for a savory application? A quick look in my pantry and I notice a box of Scottish oatcakes and Ryvita rye & oats crispbread. Crush and toss with melted butter...no reason that it wouldn't work. Preheat oven to 375F. 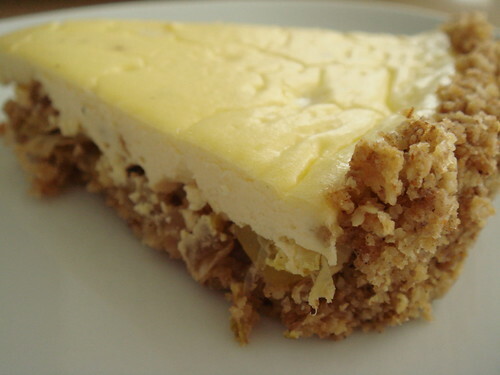 In a large mixing bowl, toss together the crumbs and melted butter until crumbs are moistened. Press the crumbs into a 11-inch tart pan with removable bottom. Bake the crust for 15 minutes. Set aside. In a large frying pan, sautee the leeks at medium-high heat with 1 tsp of oil until softened. Set aside. Using the same frying pan (I'm not a big fan of doing more dishes than necessary) over medium-high heat, caramelize the onions without disturbing them much until they are deep mahogany. Set aside. There's a lot more than what's in the photo but they look so pretty in a small dish! Preheat oven to 375F if you prepared your crust ahead of time and the oven has already cooled down. In a mixer with the paddle attachment, beat together goat cheese and yogurt at medium speed until smooth. Add in eggs one by one until incorporated. Season with salt and pepper. Nice and smooth with a sprinkling of freshly ground pepper. Don't forget to stir them in. 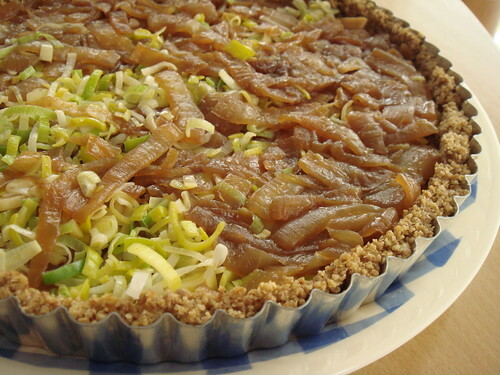 Arrange the leeks and caramelized onions into the bottom of the crust to an even layer. It already looks good enough to eat! 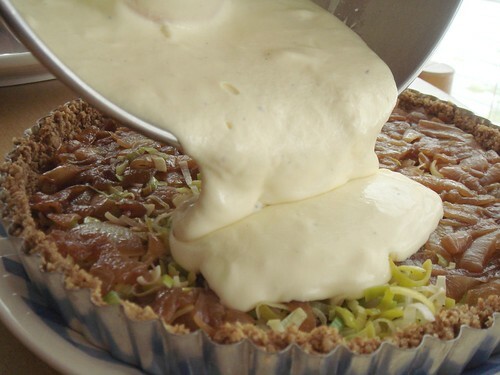 Gently top the tart with the custard mixture. If you have a little too much custard, bake them in individual silicone muffin liners. Small snack for the cook! The word "unctuous" comes to mind. No I did not lick the screen. 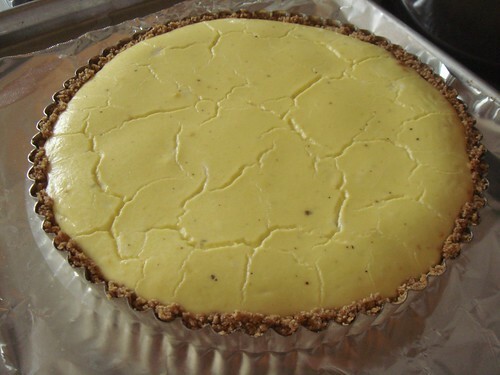 Bake for 30 minutes until custard is set. Cool for 10 minutes before slicing it into wedges. They are yummy fresh out of the oven or at room temperature. Ready at last! It's lovely with green salad or some kale sauteed in olive oil, balsamic vinegar, and lemon zest. As for my experimental crust, I love the toasty oats flavour. Unfortunately, it is just a little too fragile (read: crumbly) to my liking. My mouth is watering. I can keep staring at this! I heard of the Green Barn Market for a while already but did not really have the motivation to seek it out. Not being a morning person myself, I value my rare treat of sleeping in on Saturday mornings. However, a craving for farm fresh eggs was enough motivation to make the trek today. Am I ever glad that I did! There are plenty of farmer's market in Toronto but not many of them are open in winter. The year-round North Market of famed St Lawrence Market is an exception of course. I'm not particularly a fan though because the place can get a little touristy at times. What makes Green Barn Market different is its neighbourhood feel and its strong focus on local and organic goods. I am also partial to The Stop Community Food Centre. I think the organization is doing a lot of good things in the community. More importantly though, is the market any good? The photo on left shows the bounty I brought back. There are leeks, carrots, and kale in purple and green. I love the sweet potato stand with its varieties of sweet potatoes. I got a bunch of yellow flesh ones with a mild taste. 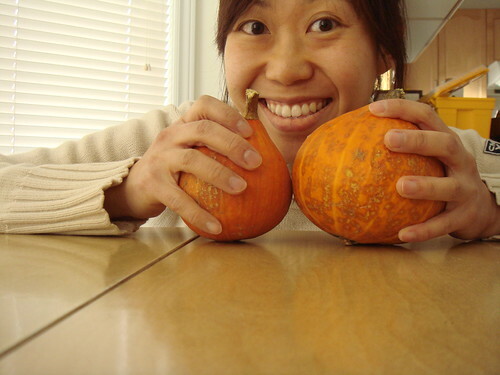 I love kabocha squash and eat them everyday. Unfortunately, I've run out of my stash which I bought in early December from the friendly Japanese farm stand at J-Town. At this point, my neighbourhood supermarkets only carry squashes from Mexico. When I saw the precious Ontario-grown kabocha at Green Barn today, of course I snatched a couple! I picked up a smoked pork hock for my next batch of split pea soup. I got a dozen of farm fresh eggs as planned. 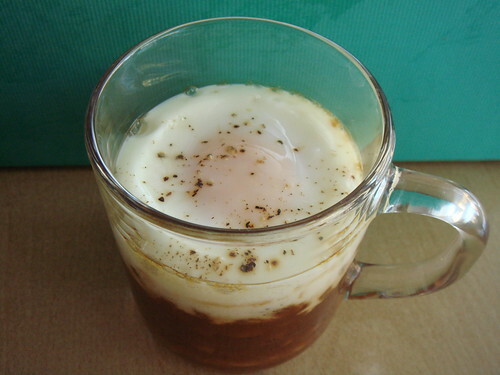 As soon as I got home, I soft boiled one for snack. Mmmm, eggs with real flavour! Last but not least, a bag of cheese curds. These ones from Empire Cheese is not squeeky but the taste is so unbelievably milky. They reminded me what milk is suppose to taste like. I could not stop eating them! I have big plans for my winter bounty from Ontario. I'm thinking Caramelized Onion & Leek Goat Cheese Tart, Kale Sauteed In Olive Oil & Balsamic Vinegar, and Roasted Root Vegetables. Looks like I'll have some cooking to do this weekend! The use of marinated duck necks is one of my more brilliant ideas in recent memory. I love split peas soup with a substantial meaty flavour. That can easily be done with smoked pork hock or ham bone and it is my usual routine. Unfortunately, like most tasty things, it comes with a trade-off of more sodium and fat. When I went shopping at my local T&T Supermarket, I spotted trays of marinated skinless duck necks (fully cooked) in the deli department. Without the fatty skin, the necks are in fact quite lean but imparts great flavour. Besides, they are extremely affordable! In a stock pot, heat 2 tsp of oil. Saute onion, celery, and carrots until softened. Add in split peas, bay leaves, and duck necks. Top with 10 cups of water. Bring to rolling boil. Boil for 10 minutes and then turn down the heat to a simmer. Simmer for 1.5-2 hours until peas are soft. Remove duck necks from soup. 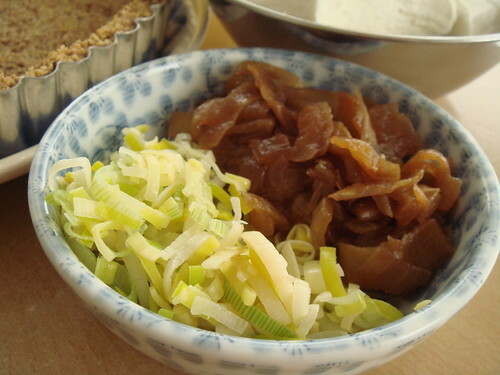 Debone (meat should easily fall off) and return shredded meat to soup. I don't know what took me so long but I've been curious about making cannellini bean dip for at least half a year. In a pantry-clearing mood tonight, I finally made a batch. Why did I not try this sooner?! Creamy and spicy, high in protein and low in fat to boot. One more delicious health food in my repertoire! In a food processor, process all ingredients until creamy, about 3 minutes. Serve with lavash, vegetable crudite, or toasted tortilla.